TV shows need to do a lot to draw my interest and compel me to watch them. For House of Cards, it was another round of major award nominations, great reviews and an ad campaign at the cinema that pushed me over the edge onto the couch. It’s not technically a TV show, being produced and aired exclusively on Netflix, but it is one of the best serial shows I’ve watched in a while and, with season 2 around the corner on the 14th of February, has potential to be a trailblazer for a new generation of entertainment. House of Cards revolves around the life of politician Frank Underwood, played by the fantastic Kevin Spacey, and his ego-driven thirst for power. As the House majority whip, he is a major player in US politics. In the first episode he is set for the job of Secretary of State, arguably the third highest position in government, but the offer is taken from under him. With the rejection, Underwood sets out to get revenge the long way round, and sets in play a series of schemes to gain power for himself by using people, their secrets and their careers against themselves. Underwood is a conniving villain, but still a likeable protagonist. Everything, or just about, goes exactly the way he wants it to. He often breaks the fourth wall to give the viewers an insight into his twisted plans, a representation of how egomaniacal he is. It may only be a glance towards the viewer, but that can hide a world of menace and evil in of itself. He is a fantastic character, and well worth watching on his own, but the real substance of the show is the way he affects the people around him. Underwood’s wife, Claire, heads up a non-profit organisation. She’s just as ruthless as her husband and is a driving force behind Frank’s ambition, helping him with his goals via her company. The story arc of the first season shows how their relationship can be close at times while distance appears between them at others, which plays out brilliantly in the last half of the season. Zoe Barnes is another of the show’s main characters. A journalist for the fictional Washington Herald, she is interested in modern journalism, against the will of her superiors at the paper. With a chance encounter at a gala event, Barnes and Underwood start a professional and personal relationship which escalates as the season goes on. Peter Russo is a Congressman with a variety of problems on his hands. From strippers to cocaine, his personal life is a shopping list of things that can stop you getting elected, and Underwood uses this to his advantage to gain loyalty and leverage over him. The season sees Russo juggling many things at once: trying to deal with his past whilst keeping his constituents, children and his secretary/girlfriend happy. He’s a good character, although I’m not quite sure whether the audience is intended to be on his side or Frank’s side at times. Russo is an interesting character with particular significance near the end of the season. The style of House of Cards is really appealing, and is as good as any high quality TV show out there. The acting throughout is superb, with the Underwoods being played particularly well. Comparing it to another political show that I’m quite fond of, The West Wing, House of Cards is gritty and dark. It shows the seedy, criminal underbelly of politics – it is never dull. Its characters are mired in ticking personal time-bombs – and the way in which they get through tough situations is clever, exciting and entertaining. Humour is wry and downplayed, and although the scripts aren’t the most fluid you will find, the writing is generally very good. Perhaps because it is only on Netflix, the way in which the season is structured is a little different from what the usual American or British show would be. The show is 45 minutes long, with no noticeable “acts”: because there are no adverts. There are 13 episodes in Season 1, less than would be in a typical US TV show but more than you’d find in a UK series. Each episode isn’t titled, just blandly named as a chapter. Along with this, each episode tends to fold into another. Only once or twice does an episode have a self-contained story that is set up and paid off in the same viewing. I think this is partly why the show felt so addicting to watch. You want to know what’s going to happen next, and what will happen to the characters. Because the whole season was released at once, if you wanted to binge your way through it all you could. I chose the more traditional approach of spacing each episode out, to let the suspense build until the next chapter just had to be watched. Whether you watch them together or apart, the last few episodes of the season are a textbook example of how to ratchet up the tension and excitement in a show. Without spoiling anything, branches of the storyline begin to come together on their own creating a feeling of anxious anticipation that can rarely be instilled by a show. The last few episodes don’t quite wrap up the events of the season, leaving plenty of intrigue and buzz about the next one. Simply put, the House of Cards is a show you should be watching if you enjoy a good slice of gripping TV. Its first season was a tour de force of stellar storytelling that has left me clamouring for the next one, which is released in full on Friday (great timing). 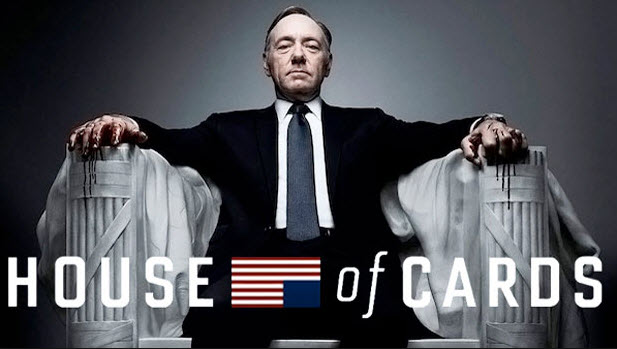 To watch it will cost you a monthly Netflix subscription, but even if you couldn’t access thousands of films and other shows, it would be worth it for House of Cards alone.